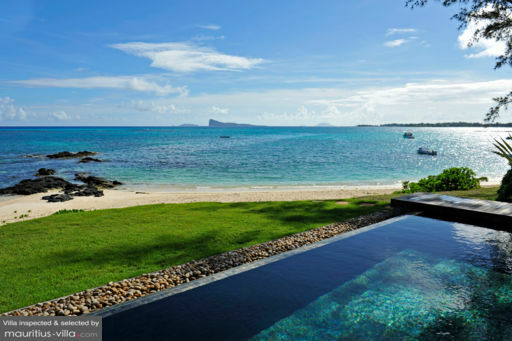 Villa Karma is a beach-front vacation residence located along the white-sand shores of Pointe aux Cannoniers at the northern coast of Mauritius. Generally contemporary in its architecture, the villa was designed for the absolute enjoyment of the sea breeze and the tropical climate. Interiors are stylishly coordinated with and complementary to the warm color scheme – yet, at the same time, dramatically in contrast to the cool hues of the ocean. If you’ve always had an affinity with the sea, Villa Karma is one special place where you’ll truly belong. The villa has four bedrooms. One is on the ground floor with direct access to the garden. This bedroom has a double bed and a dedicated bathroom. Three other bedrooms are on the second floor. Two of these bedrooms have double beds and both open out to furnished balconies overlooking the far off northern islands. One other bedroom has twin beds. All bedrooms on the second floor have dedicated bathrooms. Sloping down to the beach, the property’s fenceless outdoors is divided equally between a well-maintained lawn and the swimming pool area. 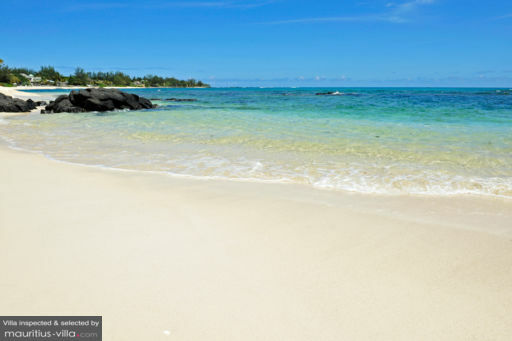 Dive into the beckoning, glassy waters for short, routine laps or for a relaxing freshwater dip once you’ve had your fill of saltwater but would still like to be in your element. While the time is ideal, get some sun on the cushioned, rattan pool beds on the wood-decked covered terrace. Once it gets too hot, seek the shade of the poolside gazebo and stretch out on cushioned, wooden day beds where you can easily drift off to sleep lulled by the sound of gentle waves coming to shore and the whisper of light balmy winds blowing by. Framed, glass sliding doors lead into the villa’s airy, semi-open ground floor. Arranged on one side are the cushioned, rattan couches and chairs of the living area. Here, you can all converge and converse as you look out to the breathtaking view. On the other side is the dining area. Sit around the wooden table for eight on matching rattan chairs as you get a taste of delectable local and foreign fare dished out by the in-house cook from the fully-equipped, modern kitchen just behind the dining area. At the center of the kitchen section is a counter that can also serve as a bar. Provided with wooden stools, this is another spot where you can grab a quick snack or have a drink. A separate TV area is also set up on the ground floor. On the large couches fronting a widescreen TV you can all gather for the highly anticipated next episode of the latest blockbuster series. Or, to relive the most memorable scenes of your all-time favorite, classic movie. In charge of extending the villa’s daily services is a staff consisting of a concierge, a cook, housekeepers and security personnel. A babysitter is on call. However, her services will be charged separately. A car is also available for rent. Villa Karma is quite close to the seaside village of Grand Bay or Grand Baie within the district of Riviere Du Rempart. Make sure your day trip includes aqua sports, deep-sea fishing and island hopping at nearby Gunner’s Quoin, Flat Island, Round Island and Serpent Island. Aside from its enchanting emerald waters, Grand Baie is also known for its world-class shopping. At local shops, malls and shopping centers, as well as designer and signature brand stores, you will surely find best buys on clothes, crafts, jewelry, souvenirs and fabrics. Extend your stay and dance till dawn at must-see and must-be-seen-in bars and clubs such as Banana Café, Zanzibar, Les Enfants Terribles and Buddha Bar. We had a most wonderful stay at the Villa. The property is of a very high quality, wonderfully appointed and maintained and staffed by the most accommodating and lovely people. 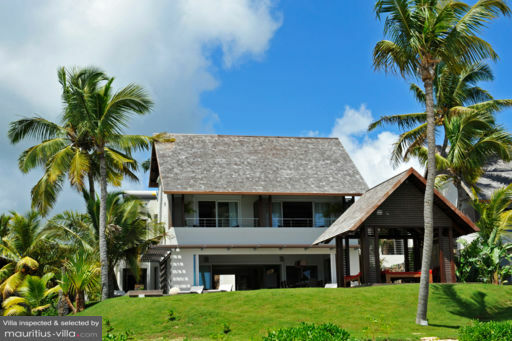 The pool and access the beach make this the ideal villa, the beach is literally at your doorstep. We were given great tips for the stay through the hiring process. The villa is very close to wonderful shops and restaurants. Made our holiday perfect. Our stay was heavenly in this villa. Decoration, equipment, personnel, part ... Everything was exceptional! We found the very spacious villa, knowing we were 8 adults and 2 babies. We enjoyed a wonderful time during our stay, the beach just before and just for us and the pool were much appreciated. It is more conveniently located as close to normal activities: restaurants, spas, shopping, bars, supermarkets. Finally, the service and the availability of Bénédicte enormously is our pleasure. Do not hesitate to ask, many services can be offered.